Mish's Global Economic Trend Analysis: Diving Into the GDP Report - Some Ominous Trends - Yellen Yap - Decoupling or Not? 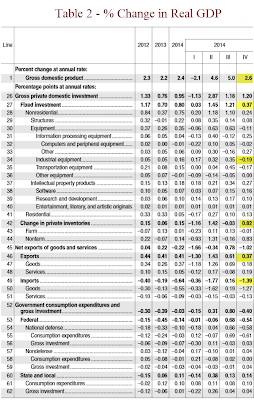 Diving Into the GDP Report - Some Ominous Trends - Yellen Yap - Decoupling or Not? On Thursday, Fed Chair Janet Yellen met with Senate Democrats at a private luncheon. She told the Democrats that the U.S. Economy is Strong. My first thought was "what the heck is Yellen doing holding a private lunch with Democrats only?" Had she met with Senate Republicans, I would have asked the same question. Apparently this is common procedure for Yellen, so perhaps I am reading too much into it. Yet, I cannot help wondering if the real purpose of the meeting was to persuade Democrats to block any "Audit the Fed" Initiatives. Regardless of the reason, Yellen had some pretty glowing things to say. Bloomberg reported Yellen Tells Senators No Rate Rise Soon Amid Concerns Abroad. The Fed upgraded its assessment of the U.S. economy in a statement on Wednesday after a meeting of its policy-setting committee, while adding a reference to “international developments” which investors took as a sign of mounting worry about weakness overseas. Economists said the confident tone of the statement from the Federal Open Market Committee signals it is on track to raise interest rates this year, while making the point it is not ignoring the weaker performance of the global economy. 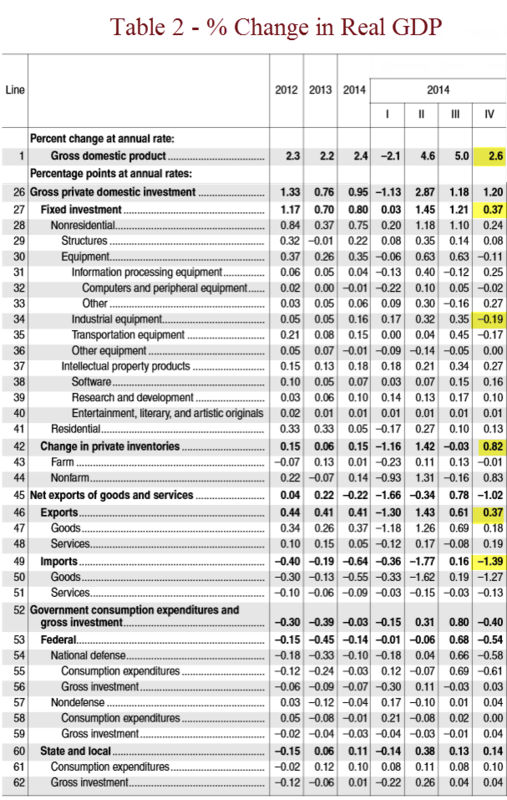 On Friday 4th quarter GDP estimates came in below economist expectations. Bloomberg reported "The advance estimate for fourth quarter GDP growth disappointed with a 2.6 percent figure versus analysts' estimate of 3.2 percent and following 5.0 percent for the third quarter. Final sales of domestic product slowed to 1.8 percent, following a 5.0 percent jump in the third quarter. Final sales to domestic purchasers eased to 2.8 percent from 4.1 percent in the third quarter." 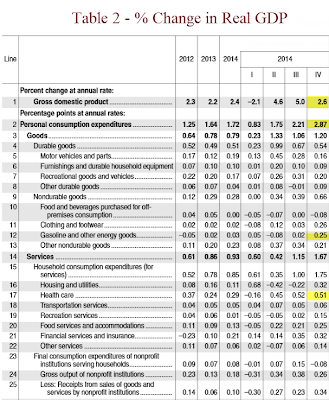 With that backdrop, lets dive into the BEA Fourth Quarter and Annual 2014 Advance GDP Estimate. Several PCE items stand out. Is the 2.87% increase sustainable? And what about health care? 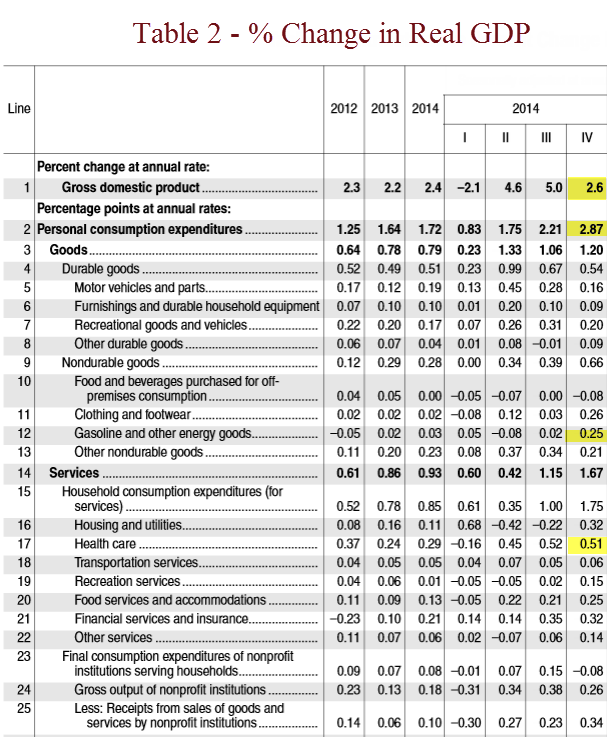 In the last three quarters, health care expenditures added 0.45, 0.52, and 0.51 percentage points to GDP. Wasn't Obamacare supposed to reduce costs? Curiously, gasoline added 0.25 percentage points to GDP in spite of rapidly falling prices. Motor vehicles and parts show rapidly slowing growth since second quarter. That's a trend I expect to continue. I discussed autos on January 6 in Economists Upbeat Despite 4th Consecutive Decline in Factory Orders; Auto Orders vs. Expectations. Autos are slowing and so will auto-related jobs. Yet economists believe "Auto sales are expected to reach their highest level in a decade this year, bolstered by strong job gains and cheap gas." My take: Autos will soon subtract from GDP.